That panel is a part of some sort, to be flown on a resupply craft to the International Space Station this coming Friday. "An anonymous tech at NASA," is responsible for laser-engraving Wheatley, the antagonist of Portal 2 the Space Core on the part, Valve said in its official Portal blog on Friday. "And please note that when we mentioned an 'anonymous tech at NASA' we weren't kidding," Valve added. 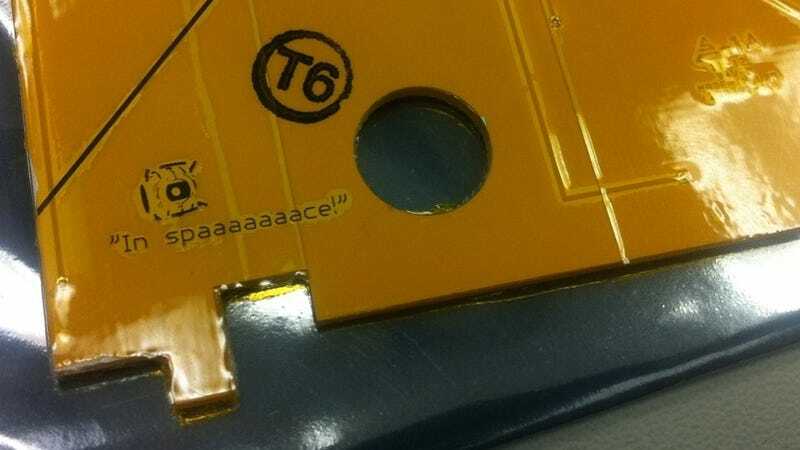 "NASA in no way officially endorses secretly laser-engraving characters from Portal onto their spacecraft." I'll refrain from making jokes as they carry a spoiler hazard (it's a year after release, but so what). You either know why this is ironic already or have the means of finding out for yourself. It's a clever tribute to the game and the character. The full size picture is available at the link. [Correction] It's the Space Core. Both it and Wheatley end up in space in the game anyway.